Sweater and jacket: 36-46cm 100g, 51cm 200g. 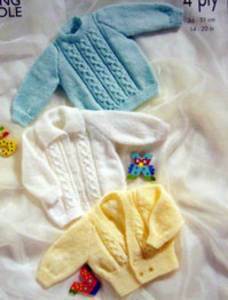 Cardigan 36-41cm 100g. Based on 100g balls baby 4 ply.4 ply Tension 28sts/36 rows to 10cm on 3.25mm needles. Recommended yarn King Cole Baby Comfort 4ply. 2.75 and 3.25mm needles.